It’s incredibly easy to lose yourself in the role of being a Head, to the point that your private life simply drops off the schedule as you work on autopilot, just getting through the day. But this is dangerous, not only for your health and your relationships, but for your school life too. As when we begin to neglect our physical, mental, emotional, and spiritual needs, our ability to meet the needs of others can also be affected and we can find leadership begins to feel (if not become) unsustainable. 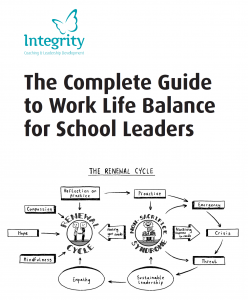 Particularly, given the challenges of school leadership today, I believe it is therefore vital our leaders devote equal time and care into their personal lives and their professional lives, and establish a work-life balance that works for them and allows them to continue to lead and inspire in their schools.